Patricia Arquette reading to a 6-year-old Ellar Coltrane in Richard Linklater’s “Boyhood,” an IFC release. When you become a parent, you fall in love. And then, you spend the rest of your life worrying about the love of your life getting hurt. It is a lifelong commitment to anxiety as you watch your child grow and make decisions/mistakes without you. This strange mixture of unmatched joy and constant terror bubbling just beneath the surface of your seemingly normal demeanor is rarely captured in a film. But in Richard Linklater’s latest film Boyhood, that reality is deeply felt. Though the parents of the main character are not themselves the subjects of this story, it is their anxieties that we in the audience are made to feel most viscerally as we watch a young boy grow from about 6 years old to 18 years old. In that time, the boy grows up, falls in love, has his heart broken, graduates from high school, and embarks upon the journey to adulthood that begins with college. And every step of the way, Linklater gives us moments of tension that we think will build to devastating tragedy, but which, instead, play out just as they would in reality 99 percent of the time, without much drama at all. Likewise, the parenting choices made by Mason’s mother (Patricia Arquette) and father (Ethan Hawke) are sometimes questionable. They are, like all of us, flawed characters who sometimes give in to the pressures in their lives. Whether it’s the stream of bad relationships (on the mother’s part) or the inability to step up and be an adult (on the father’s part), these are all choices that feel real, and they are handled in a way that acknowledges the fact that bad choices don’t necessarily mean “bad parenting.” Ultimately, these are parents who, though divorced and wildly different from each other, love their children and would die for them. But they are not perfect. Much has been made of this film’s production methods, in particular its timeline. The film went into production 12 years ago and stayed with the same cast, so what we see on the screen has a documentary quality to it as each actor–children and adults, alike–age in real life as well as in the fictional universe. No doubt, this is what drove many to add this film to their must-see list, and it is a remarkable display of commitment from all involved. Yes, the results cannot be imitated without going through that long production process, but it isn’t the reason this film should be seen and celebrated. Boyhood is remarkable for its even-toned realism. It is a slice of life–albeit a large slice of someone’s life–and it eschews any of the phony drama of most modern movies, in favor of the real drama that is real life. When I was preparing to go to the Nantucket Film Festival, the first thing on my list of films to see was Life Itself. I wanted to see it because it is a documentary about Roger Ebert, a film critic who was so central to the development of film criticism in America, and also probably the first person to introduce me to the idea that films could be taken seriously enough to argue about them on television. When I realized that the film was directed by Steve James, whose 1994 film Hoop Dreams was also central in my development as a documentary filmmaker, I was filled with anticipation for what I thought would be a film about Ebert’s work. But the film I saw was not really about film criticism and Ebert’s significance to the field; it was a document of the end of Ebert’s life, when the man known for his words could no longer speak. I’ve gone back and forth in my mind as to whether or not this was a disappointment. Life Itself does tell Ebert’s story, and there was a lot to his professional development that I did not know about, but because James’ focus is on the man behind the thumbs, the documentary is more about Ebert’s spirit. Yes, there are interviews with directors whose work he championed (most notably Werner Herzog and Martin Scorsese, both of whom I admire), and other film critics, such as A.O. Scott, Jonathan Rosenbaum, and Richard Corliss are interviewed about his contributions to their field, but a good portion of the film is spent on the footage James got of Ebert in his hospital room and in rehabilitation as he tried to recover from cancer, which had plagued him for 10 years. It is that end-of-life struggle that resonates most. 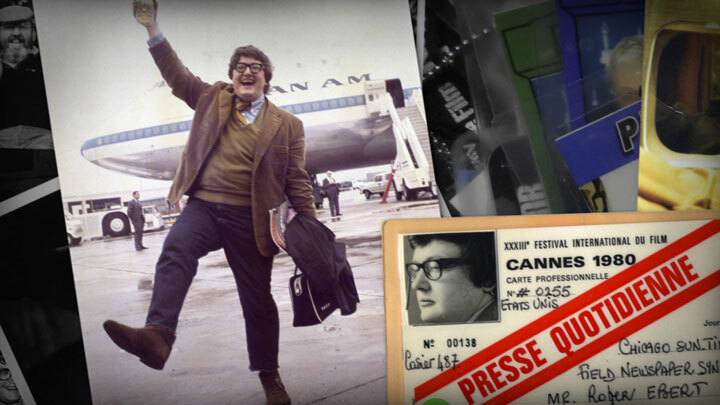 Ebert is depicted as a character of depth and complexity, which is rare in contemporary documentaries. In fiction films, we are given complete access to the characters created for the story–their emotional lives, as well as their behaviors. But in a documentary, we are often limited by the subject’s power to reveal only what (s)he wishes to make public. In this case, the film is based on Ebert’s previously published memoir of the same name, but in James’ hands–with this footage of Ebert at the end of his life, the choice to include his step-children and grandchildren, who learned a lot from him, as well as early outtakes from the Siskel and Ebert television show that demonstrate the very real animosity between the two critics–we see many layers to Ebert’s personality. He is a loving and beloved husband, stepfather, and grandfather. He is a sometimes arrogant film critic and writer who had no trouble defending his views, but who, unlike the stereotypical critic, was just as passionate in promoting outstanding films as he was in cutting down poorly conceived, bad films. It is not all a show for the cameras, although Ebert seems to have been very pleased to have become a film subject in his last days. There are things missing from this documentary (for example, Siskel’s successor, film critic Richard Roeper is never mentioned, although he co-hosted At The Movies with Ebert for eight years), but then how could there not be; no one’s life story can be told in 116 minutes. This depiction feels very real. Ebert was criticized, along with Gene Siskel, for having simplified criticism with the thumbs up/thumbs down designations, but for those of us who have actually read Ebert’s criticism and not just watched him on TV, the thumbs are a minor part of his contribution. Ebert, the film tells us, once called the movies “a machine that generates empathy.” Life Itself fits that description as well. It also leaves us thinking about mortality, love, passion, and how to embrace life’s challenges. The feeling I left the Dreamland Theater with after seeing Life Itself was one of loss, but at the same time, I felt reinvigorated about the value of cinema, and I think Ebert would have liked that. It’s a crazy week this week. I will be writing about the films I saw in Nantucket, but since neither one is in theaters yet, take a look at this review I wrote in Provincetown Magazine, of the very funny Obvious Child. For those of you not near Provincetown, it is also playing at the Cape Cinema in Dennis.